The place is great situated. It's clean and silent. Manager is perfect on communication, helpful and friendly. 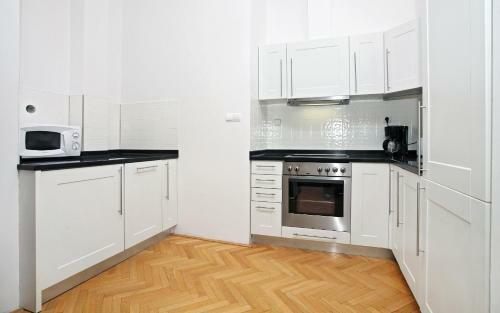 Beautiful flat with comfy beds, spacious living room and well-equipped kitchen. Great location. Good price. Close to many amenities - listing accurately describes the accommodation. Nice flat, very comfortable and right in Old Town. Apartment is pretty. Wi-fi was fast. Mattresses were comfy. Nice building. Clean. We had short but very nice stay. Money well spent. The place is spacious. Everything looks in good shape. Wonderful location. Fast wifi. The apartment was clean and nice. The kitchen was equipped with all staff for cooking. Everything worked properly. There were 2 wifi networks. The house had an elevator. Doors were closed secure. It was nice to stay there. The apartment was very well located , clean and cozy . Veronika was an amazing host, helpful and communicative . Highly recommended . Lock in a great price for Taurus 12 – rated 9.3 by recent guests! Taurus 12 This rating is a reflection of how the property compares to the industry standard when it comes to price, facilities and services available. It's based on a self-evaluation by the property. Use this rating to help choose your stay! One of our best sellers in Prague! Taurus 12 is a self-catering accommodations with free WiFi, set in a central location of Prague, 2,950 feet from the Wenceslas Square and the Charles Bridge. The apartment features a flat-screen satellite TV, a fully equipped kitchenette with dishwasher and microwave, a washing machine, ironing facilities, and a bathroom with shower, bath tub and hairdryer. Prague Castle is 1.1 mi from Taurus 12. When would you like to stay at Taurus 12? House Rules Taurus 12 takes special requests – add in the next step! Taurus 12 accepts these cards and reserves the right to temporarily hold an amount prior to arrival. My family stayed very satisfied. We enjoyed our stay and are happy that we chose this flat. 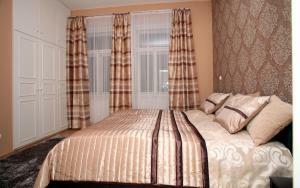 It suited all our needs: comfortable beds, towels are provided, equipped kitchen. Couldn't wish more. Thanks a lot. Owner said its not allowed to smoke in the apartment. All Prague main signs, bars and clubs are easy to reach. Big shopping mall is only 2 min walk as well as a river. Loved staying here! The location was great and host was super friendly. Great place to stay, easy to get around to different parts of the city. 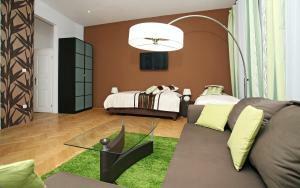 We had a very nice stay in the apartment, the description is very accurate and the location is quite central. To be recommended! Comfy place with great location. The flat looks like large hotel suite.